With much of the recent Duck news being about players leaving, as Marcus Mariota and Arik Armstead have both declared for the NFL draft, one Duck decided to stay. DeForest Buckner could have been a second or third round pick, and was rated the 8th overall defensive end according to cbssports.com in the upcoming May 2015 NFL Draft. Rob Mosley broke the story of Buckner’s decision to return yesterday, but what exactly does his return mean for the Ducks’ 2015 season? Buckner’s 13 tackles for loss were tops on the team. Buckner is a beast. Standing about 6’7″ and weighing in at just under 290 pounds, he has been an anchor for Oregon on the defensive side of the ball, starting 23 straight games for the Ducks. In my opinion, he has been the better lineman out of himself and Armstead. Buckner is a more consistent player and better edge rusher, he also plays the run well which is evident by his 81 tackles this season. He reminds me of Igor Olshansky in that he is able to play defensive end and defensive tackle and has good strength and overall quickness. Returning for his senior season will not only give the Ducks a talented player, but also a veteran leader, something the team will desperately need on defense. 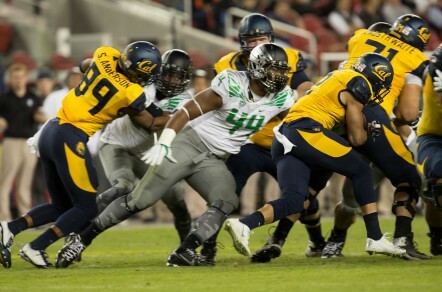 DeForest Buckner returns needed size and skill to the Duck defense. The Ducks defense loses seniors Ifo Ekpre-Olomu, Derrick Malone, Erick Dargan, Tony Washington Jr., Troy Hill, Dior Mathis, and Isiac Ava; add in Armstead’s early departure and those are some big holes to fill on the defensive side of the ball. So it will likely be Buckner and Joe Walker leading the unit next year in tackles and in leadership. Oregon had many young players earn valuable experience and reps this past year, but having Buckner back to help lead the way is huge. If Buckner can improve on his solid 2014 campaign he could be a first round pick, possibly even as high as a top-10 choice in next years draft. Losing Mariota will slow them down a bit offensively — at least to start – which will put more pressure on the inexperienced defense than in previous years. 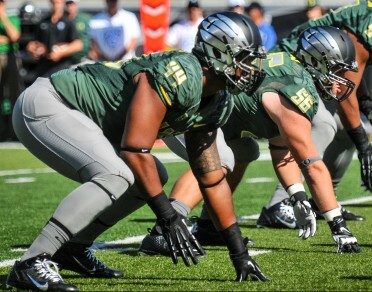 With Buckner’s versatility in both the pass rush and run defense, he will certainly be an impact player for the Ducks in 2015.